Spirit Awards voters might not have picked the movie that’s going to win Best Picture at the Academy Awards this year, but they did pick the closest thing they could find — even as they were also giving the Oscars a few lessons in what diversity looks like. By choosing “Spotlight” as the Best Film winner and also giving it four other awards, voters went for the only one of the five nominees that is also a nominee in the top Oscar category. 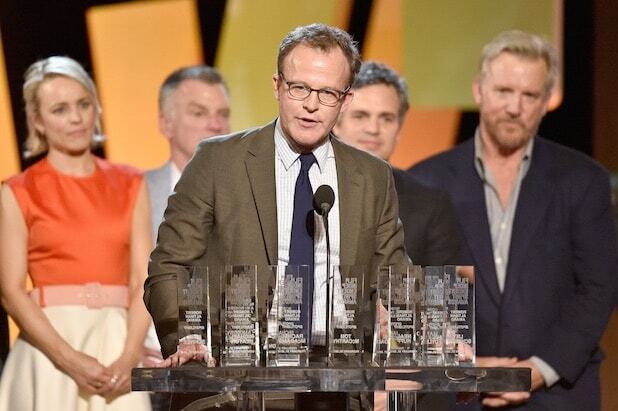 And they gave Tom McCarthy’s drama about the Boston Globe’s investigation into sexual abuse and cover-up in the Catholic Church another reason to celebrate near the end of an awards season that has been filled with such reasons. The clear critical favorite among 2015’s awards contenders, and the winner of the Screen Actors Guild ensemble award and the Critics’ Choice Movie Award for Best Picture, “Spotlight” went into the Spirit Awards as the heavy favorite and came out as the big winner, which gives it the chance to become the fourth Spirit winner in the last five years to go on to win the top Oscar. But that would be an upset on Sunday. “Spotlight” clearly has a chance to take the top Oscar, but most signs point toward “The Revenant” or “The Big Short” taking that trophy instead. Still, Spirit Awards voters did what they’ve been doing in recent years: When they had the opportunity to do so, they handed their indie trophies to the same films and the same people who’ll be trotting out variations on Saturday’s acceptance speeches come Sunday. But as the Oscars got more indie over the years, the indie awards got more Oscary. Between 1986 and 2011, the two shows agreed on the year’s best movie only once; between 2012 and 2015, they did so three times. That’s due in part to the Academy’s embrace of smaller films, but it’s also a function of the way the Spirit Awards work. Nominations are made by small, blue-ribbon juries that will choose relatively mainstream films like “Spotlight,” “Carol” and “Beasts of No Nation,” but also much smaller and more idiosyncratic works: “Tangerine,” “James White,” “Bone Tomahawk,” “Mediterranea” and others were top contenders this year. But the final voting is done by the entire membership of Film Independent, which consists partly of people who work in independent film and partly of movie fans who pay the modest yearly dues. According to Film Independent president Josh Welsh, those voters number close to 10,000 and are far more diverse than their counterparts in the Academy: 49 percent female and about 30 percent minority. Although Film Independent stages screenings and supplies screener links, those voters are far more likely to have seen the higher profile films, and far more likely to reward them. Saturday was more of the same: “Spotlight” won Best Film, Oscar favorite Brie Larson won Best Female Lead for “Room,” and “Son of Saul” won Best International Film. The thing that made the 31st Spirit Awards a little more interesting than the 30th or 29th, though, is that the nominating committees came up with slates of acting contenders far different — and far more diverse, to use this awards season’s buzzword — than the Academy did. Attah is an African teenager who made his film debut as a conscripted child soldier in “Beasts.” Elba is a Brit of African descent. Taylor is a transgender black actress who starred in a movie shot on an iPhone on Santa Monica Blvd. When you throw in the fact that the Best First Feature Award went to writer-director Marielle Heller for “Diary of a Teenage Girl,” a film completely about a young woman’s experience, the voters embraced a range of experience and points-of-view that is too often missing from the big show down the road. At the same time, though, the voters couldn’t help but keep the spotlight on “Spotlight,” honoring the one of its contenders that has a chance to make an impact on Sunday.